Nancy Bird, London, 1939, originally uploaded by State Library of New South Wales collection. Hi everyone. My name is Louise Thomson. I am currently working on courses number 8 and 9 (!) in the MET program and am working full time as a grade 2 teacher in a rural community in beautiful Vancouver Island. I chose this picture because of the conversations I have been having with my co-workers all week about technology integration into our non-techie school. I have spent this first week of school with the grade 5’s because our class assignments have not been made and chose to teach them how to do claymation rather than some of the usual first week stuff. They have blown me away with what they created! When I saw this picture I thought about how exciting new technology often for some and how intimidating it is for others. Like this plane, in the wrong hands it can also be dangerous!! Sorry… Nothing deep I just like the picture. 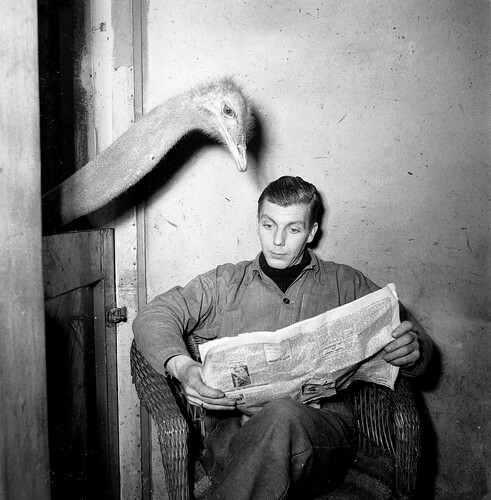 Artis struisvogel leest krant van oppasser / Ostrich reads newspaper of caretaker, originally uploaded by Nationaal Archief. My name is Ed Stuerle. I am an elementary teacher in Kelowna, BC. I have been teaching here since 1983. I am currently teaching Grade 5 part time and I am doing some prep relief in the computer lab for the rest of the time. I really enjoy my time in the computer lab (that is until the computers start misbehaving). I find that it is very easy to motivate the students and that many students who might struggle in the traditional classroom often are quite comfortable using technology to present their understandings. I chose this picture mainly because I enjoy the humor in it. I must admit that I’m not the philosophical type so if I claimed that the picture reminded me that all living creatures make sense of their own reality in their own unique way… well I’d be full of bull. What can I say… it’s a funny picture and I like it. Language Barrier, originally uploaded by Xiangdian. Though many countries have access to the printed word, be it through the local library, bookstore, or the Internet, there are places where text is censored. I typed into the search engine the words “language barrier” with images already in mind, however when I came across this image, I was immediately taken in another direction. I realized that even though technology is helping to establish dialogue in a greater worldwide community, there is still some censorship. This also made me think about personal experiences where I was traveling that made me crave the written word, albeit a newspaper or a trashy novel. It made me feel connected somehow. This photo reminded me that many are not connected. This then made me think about the benefits of technology for those in other countries, those with lower literacy levels, etc., but I’ll spare you my meandering thoughts–this is merely an introduction! I’m Kelly Kerrigan and this is my sixth/seventh course in the MET program. I’m currently taking 512 this semester as well. As an elementary school teacher in the Vancouver area, I am fascinated by the changing role that technology brings to text, to the classroom, and finally to my students. This looks to be an exciting course! Looking forward to working with you all. Image from my archives. From a VPN magazine article. The picture I selected reminds me of writing, as it generates in me a thought that the stitching together of units will result in a synergy; in the case of genes, life. More than the sum of the parts. How we turn a blank slate (be it stone, paper, or an electronic interface) into a carefully crafted, stitched together collection of units (words, phrases) called writing is a process applied in very different settings and media these days. Successful text technologies are the sum of much more than the jumble of letters one sees if quickly perusing a text-filled page. 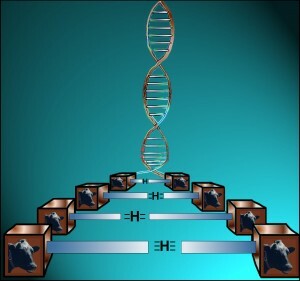 In the image, we see a stitching together of the building blocks of life; seeing something with a high degree of order formed using a finite collection of building blocks. Writers must first face a blank “page”, and their text changes the space. The writing will change those who can assimilate meanings from the words and phrases. How a writer will achieve that end is determined by the traditions and rules of each language, the tools, the cultural setting, and will evolve according to the times they live and work in. I think this will be a fascinating course. I have had the good fortune of being able to wear many hats over the years while working on educational projects, but around every corner in the MET program, I find challenges and enrichment of my understanding of the processes we can apply, in order to turn a “blank slate” into something much more. 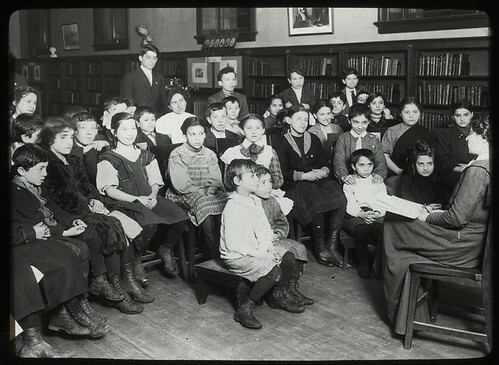 Work with schools : a librarian’s assistant telling a story …, originally uploaded by New York Public Library. Whenever I see old photos like this I try and imagine being there in the room, able to look around at parts of the scene that aren’t in the picture. At first this photo appealed to me because it shows the power of literacy, the kids appear quite engrossed with the story, or at least most of them do. But then I started walking around the room and realized that right beside the kids is a photographer with a very large camera (this is ca. 1910), some of the kids are looking at the camera but most of them aren’t, so then I have to wonder is the photo a ‘set-up’ taken to demonstrate the power of stories and to promote the library? If you aren’t a cynic like me who looks for set ups and fakery then it works, it does promote literacy and in turn the library, the kids look engrossed, and anything that promotes opening a book is o.k. by me. I’m a technology education teacher in Victoria. For a number of years now I’ve been dealing with everyone immediately assuming that I teach something to do with computers. Actually Technology Education is what you would call (correctly) ‘shop class’. My interest in this class comes from a few directions, at one time I was an English major and I’ve always been interested in books and reading, note I said ‘books’, I’m a book person and at this point I’m holding on tight to the idea of being able to hold a book and have it physically in my hand. I can’t see me ever enjoying holding on to a little computer to read a piece of fiction, but I think it’s coming. So I guess this class is to help me with the shock of the new. The other reason I’m interested in the class is because in my field I deal primarily in the verbal rather than the written, so I’m interested in how communication changes and varies from verbal to written or vice versa. Japanse karakters / Japanese characters, originally uploaded by Nationaal Archief. This image of Japanese characters caught my attention by mirroring my keyboard… in the past. These carefully crafted characters represent the painstaking process by which raw materials were transformed into symbolic characters which were in turn arranged to form meaningful text. Looking at the neat rows of letters on my own keyboard, I can see how technology has transformed not just the final product of texts, but also the mechanics by which we create text. The sophisticated technologies that have been developed since 1938 (when this image was taken) have removed the ink from the process of mass producing writing and have allowed the push of a button to summon and banish the components of text. My name is Rachel Bronk and ETEC 540 is my 8th course in the MET program (graduating in April!). I live in North Vancouver, BC and when I’m not “MET’ing” I can be found swimming, reading “non-school books” or planning my wedding. I am the IEP/Assessment Coordinator at the senior campus of Collingwood School in West Vancouver, BC. I admit that my position it not as directly related to educational technology as I would like it to be. However, in working with students who have learning disabilities I am amazed at how technology has been able to provide supports and innovations that are truly breaking down barriers. I mainly coordinate IEPs and assist with programming for students who have a reading disorder or disorder of written expression and the text technologies addressed in ETEC 540 that are “changing the spaces of reading and writing” are doing so for my students as much as they are for anyone else. I look forward to working with everyone in this course. I chose this picture because I think it demonstrates the profound influence that new technology (in this case information technology) can have on our education system. Around fifteen years ago the NB Dept of Ed. sold off a lot of the industrial tech equipment to buy computers. The reason being was that the province thought students would be better prepared for the world of tomorrow by teaching them IT literacy skills today. 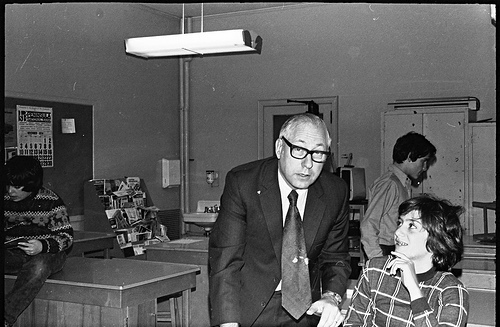 Years later, it was realized that industrial technology and learning trades was a vital part of the NB economy and they began buying the equipment back so they could reinstate the industrial tech programs again. I think the lesson of the story is that, although the information age has undoubtedly reshaped culture all around the world, we should not be swept away by the introduction of a world-changing technology. It may change the way we look at the world and everything around us, but there are somethings that we will always need despite the marvels of the information age. On a personal note, I am a middle/high technology teacher at the Canadian International School of Beijing and I am currently enrolled in this and ETEC590. I will have completed my degree requirements at the end of this term. Can’t wait! Typefaces Galore, originally uploaded by Kevin Lawver. My name is Natalie Giesbrecht and I am a Distance Learning Program Development Specialist (aka the fancy name for instructional designer) for the online distance education unit at the University of Guelph. I work with faculty and instructors to design and develop online courses for degree students and adult learners. Prior to this, I guided a team of designers and copyright assistants to produce and distribute course materials. As for education, my degree is from the University of Guelph, where I studied photography, video, sculpture and art history. Over the last 10 years I have developed a fascination for graphic design and typography. So when thinking about the words text and technology, for me the printing press naturally comes to mind. 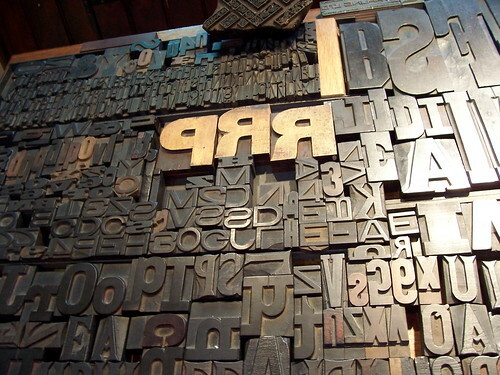 Thus the photo I choose depicts wood letterforms used in letterpress printing. 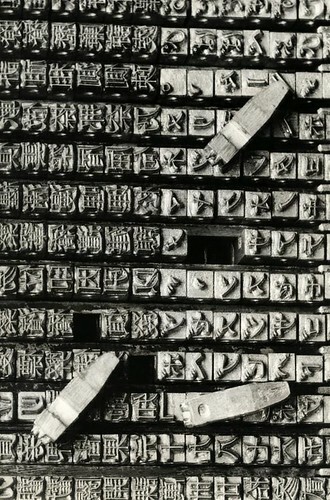 Letterpress printing is certainly both an art and a craft – though now a dying skill. Last summer I was lucky enough to get a tour of Coach House Press in Toronto, Ontario and an opportunity to try my hand at letterpress printing. From this experience I learned how much time and accuracy is needed in order to perfectly typeset a final printed product. Consideration is given to every aspect of each letter on a page. Most importantly quality checks on the finished pieces are always done to ensure that the reader has the best experience possible. With the speed and ease of computer publishing, I have a whole new appreciation for traditional ways of printing. ETEC*540 is my 9th course! During this semester I am interested in exploring the convergence of old and new technologies and how this affects literacy – particularly printed books versus e-books. I am also interested in how new media, mobile and social technologies impact how we communicate – the way we read, write, find and understand information – and how this impacts online education. With the variety of backgrounds and skill sets of all of us in this course, I think this will be a challenging and rewarding semester! Mayan writing at Palenque, originally uploaded by scrappymoduinne. I chose this picture as I have been fascinated since I was a small child with the different ways in which human beings communicate with each other. I used to spend hours looking at Egyptian hieroglyphics, trying to imagine what messages could be discovered, if I only knew how to interpret them. From hieroglyphics I moved on to books and by the age of three I learned to read. I think I learned so quickly because words seemed easy after hieroglyphics and I hated having to wait for an adult to read to me. 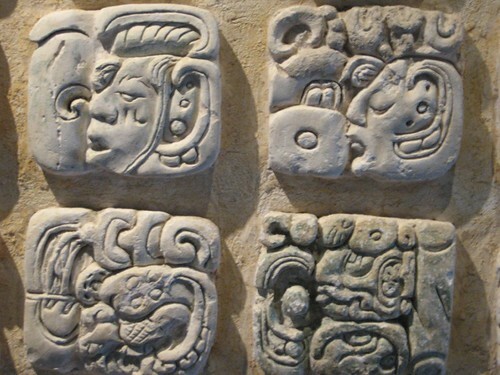 When I moved to Mexico and came across Mayan writing it brought back so many memories from my childhood. Next I moved to Oaxaca and discovered that a lot of the people I met spoke an indigenous language, but did not know how to write it. Writing in their own language has never been necessary for them, as they can write in Spanish or a foreign language such as English, if they need to. My name is Clare Marie Roche, I am from Liverpool, England and I have been living in Oaxaca, Mexico for the last eighteen years. I am a widow and I have two daughters and a granddaughter, all of whom speak Spanish as their first language. I have been working at a small, private university for the last fourteen years. I am looking forward to working with all of you. Information Overload, originally uploaded by ~ Solstizio ~. I chose this image to represent the text overload that engulfs our daily lives. In the first semester of this master’s degree I discovered the writings of Neil Postman and his vision made a deep impression on me. In his book “Technopoly: The Surrender of Culture to Technology” (1993), the author asserts that no technology is neutral and that we should be conscious of the changes to society that the introduction of new technology provokes. He also notes that we are presently bombarded by more and more information (texts) and that this excess has not made us any happier since few of our problems are caused by a lack of information. My name is Dilip Verma, and I am married with two children. My background is mixed both racially and professionally, but presently I reside in Oaxaca, Mexico and work as the Director of the School of Languages at the local University. I am studying in a joint degree program between UBC and the Tec de Monterrey. This is my first course with UBC and it is a pleasure to be able to write in English. I have little experience with blogging and no experience with virtual social networking, but I am not a Luddite either. I understand that the new technologies of communication are here to say and I look forward to discovering a considered, culturally sensitive approach to their incorporation into my teaching. Currently, for me the term “technology” refers to a system in society. It is too difficult for me to consider technology a simple tool. Technology is just as much the ability to use a tool as it is to be the tool. Technology can function within its own system independently (mechanized production) or it may require other elements to function as a system (a human programs a machine). I chose the image of Akihabara, the electric city, in Tokyo, Japan to translate visually what the term technology means to me. 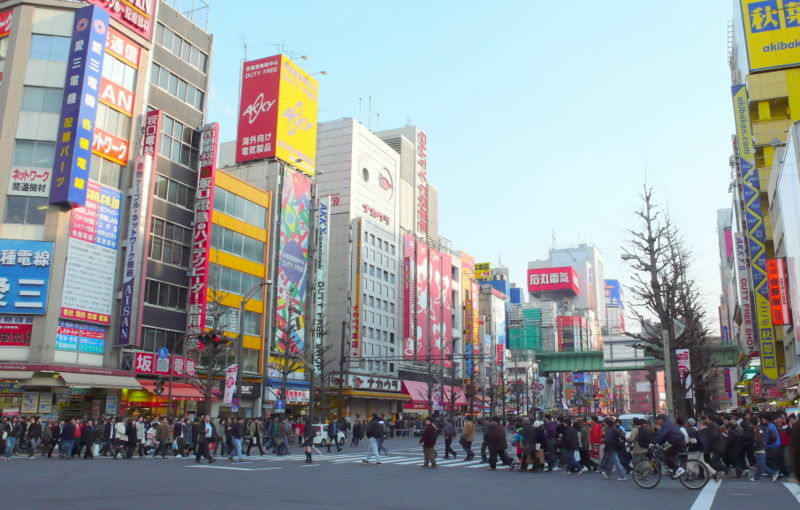 I lived in Tokyo for 10 years and I often went to “Akiba”. Akihabara functions as the system I’m trying to describe in words. Every aspect of it the city is related to the creation, use, improvement and distribution of electronics. It’s one of the most futuristic places in Tokyo and often made me feel like humans were in service to the machines, but in a positive way. I am not stating that electronic=technology, but I am (hopefully) showing the importance of the system and drawing attention to the way society is shaped by and shapes technologies. What is text? At the beginning of this course, text for me is the act of putting in a form of writing another form of communication. For example, text can be printed, inscribed or typed to communicate a message. According to the Oxford English Dictionary Online (OED) text is “The wording of anything written or printed; the structure formed by the words in their order; the very words, phrases, and sentences as written.”, literally that which is woven. Interestingly, there is an area in academic study called “text mining” and according to Hearst (2003) it involves computers discovering unknown text-based information by extracting what is known and creating new connections to produce new knowledge. This led me to consider text as a system of creating such links, to slowly weave together ideas in society. I selected this image to represent text to me as a form of expression that is open to new connections and evokes a sense of woven words. 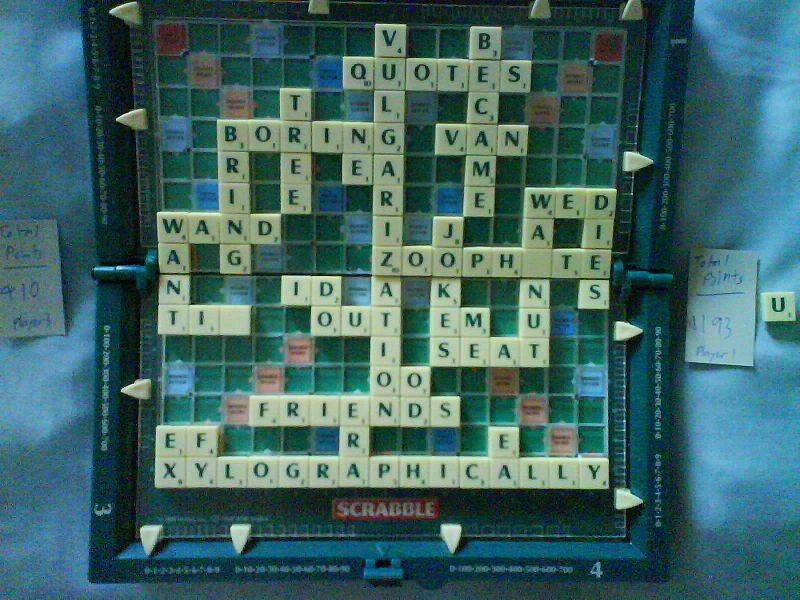 The image is based on the popular game Scrabble, where words are connected until the board is filled in an elaborate pattern of text. When I saw the image, I instantly read the words, searching for a meaning. My name is Erin Gillespie and it is a pleasure to be in 540 with you. I teach grade four at an international primary school and I prefer texting to phone calls. Design Book Library 01 4, originally uploaded by Outofprint. 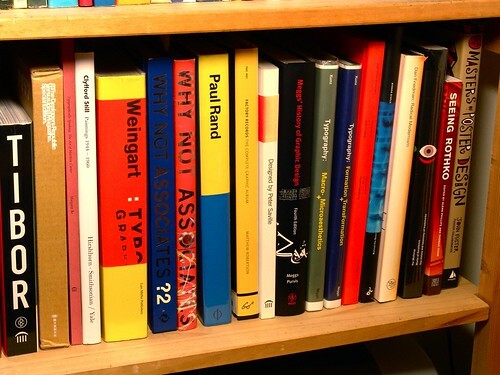 I chose this photo because the bookshelf contains a collection of resources related to design, typography, text, and technologies. In the Module 1 course content, we are challenged to think about text and technologies in their varying forms and how it has evolved, become part of innovation and is being re-innovated. 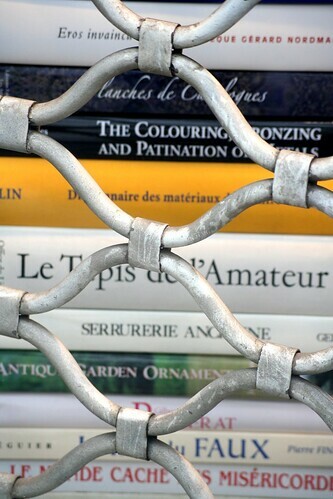 Not only are these books resources, but simple as they look, they also exemplify elements of design in the spines – creative ways of arranging text to convey typography. My name is Marjorie del Mundo. I have a background in interaction design and have worked in marketing and graphic design. Currently, I am completing my final week as an Educational Programmer for UBC Student Development and am looking forward to the launch of the Discover Your Major guide for undergraduate Arts students which I helped develop over the summer. During my design studies, I had to investigate and explore the use of text and typography as a foundation for creating layouts and spreads. In this course, I hope to expand my knowledge on how text and technologies impact the way we share information and communicate in various contexts. The panic key, originally uploaded by Phil Romans. At what point have we gone too far? Have we turned too far from the idea of text as an accurate representative of oral culture? This photo instantly made me think, not only about the consequences of our actions and race toward the ever-advancing technological frontier, but about our control in altering, stopping, or slowing the technological advancement. What would it look like if we had time to reflect on how we are changing the purpose and definition of communication, text and recording of our history? Where as once, history was recorded carefully through memorization and retelling of oral legends (Beowolf), it may be argued that history may be viewed as a collection of massively overproduced chaotic relics by those who study us in the thousands of years to come. 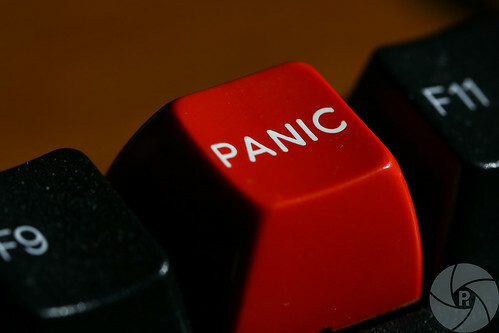 Do we have the power to push the PANIC button if we need to? I am looking forward to exploring the history of text and how technological ‘advancements’ have altered our thoughts, values and approaches with regards to recording our voices. I am currently teaching at the secondary level in Terrace, BC. I am taking 2 courses this semester (5 and 6) and anticipate a very busy few months with work, the MET program, my kids, and everything else! Looking forward to working with everyone in the course!